Ahh, Thanksgiving. A reason to visit your relatives, stuff your faces with tons of food, and most importantly, 4 day weekend, which also means Thanksgiving Leftovers brunch 3 days in a row. The next morning is always my favorite time of the whole Thanksgiving holiday. Sure, it’s Black Friday, but seems like less people care about sales and just sleep in and dive into the leftovers for breakfast/lunch (aka brunch) instead, myself included. 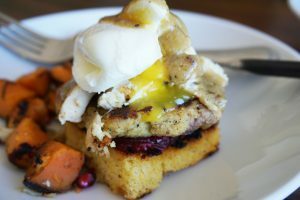 This morning after watching a couple episodes of Giada’s leftover ideas, I decided to take her eggs benedict a step further and here is what resulted from it: Thanksgiving Leftovers “Eggs Benedict”. Bring a pot of water to boil, add a tablespoon of apple cider vinegar. Heat your skillet to medium hot. drizzle some olive oil. Butter your cornbread on each side and drop on the skillet. Form stuffing into small patties, about same size as your cornbread. Add to the hot skillet. Turn after a couple minutes. Remove from the skillet and place on plates. Spread cranberry sauce on the corn bread, top with stuffing patty. Add more cranberry sauce on top of the stuffing if you want. Chop your turkey, dice your leftover roasted potatoes, ad tot he hot skillet and add a dab of butter. Cover and cook for a couple minutes. Poach your eggs. Using a spoon, stir the boiling water to create a spiral and drop the egg in the center. Let poach for a minute and a half. Remove on a paper towel. 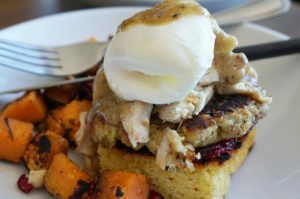 Assemble your eggs benedict: add turkey on top of the stuffing patty, drizzle with gravy, top with the poached egg. Drizzle with more gravy. Serve you Thanksgiving Leftovers brunch with a side of potatoes and mimosas. I hope you had a great Thanksgiving! Share your Thanksgiving leftovers brunch recipes with me in the comments.